It's time for tea at Jamba Juice. Don't get it twisted, Jamba isn't just serving up your average cup of leafy goodness. Rather they are adding a sweet refreshing twist to the unsweetened organic green tea used by infusing it with real fruit juices. The flavors (clockwise starting with the left picture) are Pomegranate, Passion Fruit, and Prickly Pear. Containing over 50% real fruit juice, this new line of beverages are a refreshing break for the days when you want a fruit serving and want a cool drink, but you don't want the bulk of a smoothie. While the juice listed in the name is the primary juice, there is also some lemonade to balance the flavors of the tea and the juice. The final ingredient in the drink is the organic green tea, and you can order your drink with more tea and less juice to save calories and reduce the sweetness! Pomegranate: This tea is sweet but not overly sugary. 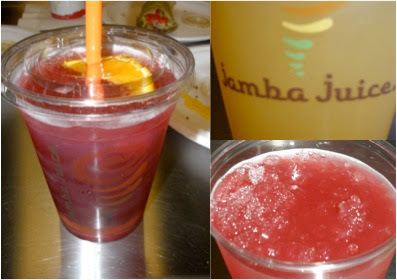 The pomegranate juice adds a slight tartness to the beverage which makes it a great choice to go with a richer entree. With 160 calories and 1 gram of protein, this is the highest calorie choice on the Tea Infusions menu. Passion Fruit: I described this beverage in my notes as "very gulpable." It has a floral taste and I enjoyed swishing it around my mouth and over my tounge while drinking it. This was one I savored until the last drop, enjoying the mellow but complex flavors of the passion fruit on my palate while munching on the fabulous crushed ice in the cup. At 150 calories and 1 gram of protein, I could imagine enjoying this with a salad or sandwich, but honestly I drinking it sans food. Prickly Pear: This tea infusion was the juiciest of the line in my opinion. I would describe it as a "plump" flavor that could be chewed, but the beverage itself (see bottom right picture) was as clear as the other drinks. The Prickly Pear Tea Infusion does contain 1 gram of fiber in addition to the 150 calories and 1 gram of protein. I think the choice is the best one on the menu for kids as the flavor is one I would love to turn into a juicebox! Overall, the calories are higher than a plain cup of tea, but as someone who doesn't drink soda, I will change up my low calorie beverages for an occassional treat that is also a serving of fruit! And with the new Jamba bundle, why not? Can you taste the green tea at all, though, with the added fruit juice in it? Oh I love Jamba Juice! When out on Oahu visiting my (oldest) daughter we frequent it much. But we usually bop in there and pick up a smoothie for lunch to drink as we go about shopping or off to the beach (she lives in Waikiki). And now that my youngest has moved out to Colorado Springs, I've stopped in their shop out there. But I have never had one of their teas. I will have to try one next time. Wish we had a Jamba Juice out here in Rhode Island. That looks soooo good! Just wanted to drop by and say thank you for visiting my blog on my FB day over at SITS! Have a great day!